When I started “running” in 2007, I defined a run as any locomotion that involved lifting my feet off the ground. It wasn’t pretty or fast – I was almost 40 pounds heavier and sported a terrible heel strike. 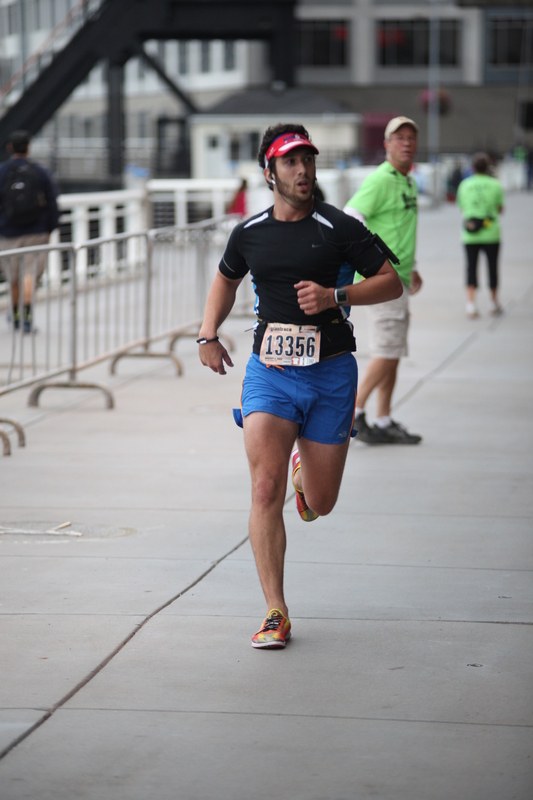 I eventually ran my first half marathon the following summer – the NYC Half, in 2:11. After breaking the tape, a speedster coworker casually mentioned that he finished in 1:45. 1:45. As 26 minutes faster than me – 2 whole minutes per mile. I was stunned, and a bit discouraged to think about just how far I had to go before I too could call myself a runner. 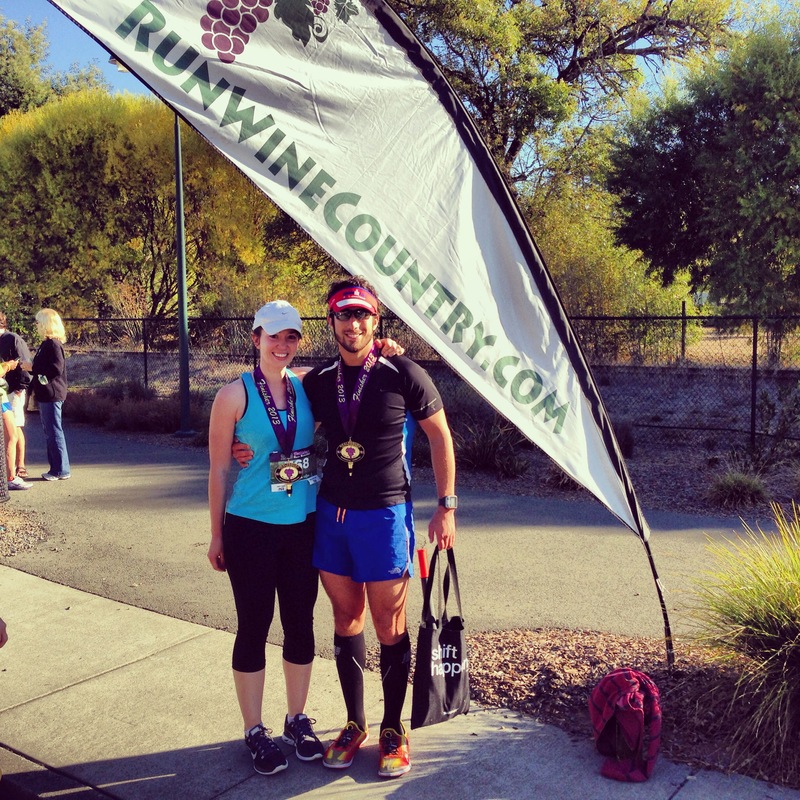 Celebrating our 13.1 PRs at Healdsburg Half Marathon. Reaching new highs – throwing down my first sub-45 minute 10K at the Giant Race. Run faster – this may seem obvious, but there is no fad-diet equivalent for runners seeking a speed breakthrough. It will feel uncomfortable and even hurt at times, but my biggest breakthroughs have come as a result of pushing the pace. Whether you do it on your own or chase someone much faster than you, there is no avoiding the inevitable: you must run fast to run fast. Much like when I first started running and focusing on moving time instead of distance, I treated running faster the same way: run as fast as you can for as long as you can handle it, and then slow down. You will be surprised to see how long you can hold an uncomfortable pace. Run lighter – would you show up to your A-race expecting to PR with a 10 pound backpack on? Losing weight will make your average effort that much easier and introduce a top gear that you didn’t know you had. Don’t neglect distance workouts – long, slow workouts are great for building the aerobic capacity and muscular endurance you’ll need to run fast in short spurts. If I have the ability to run three times per week, I opt for a speed workout, a pace workout (pace is dictated by my upcoming race), and a distance workout. Lift weights – strength training reduces the likelihood of injury, boosts metabolism, and increases power output. Don’t neglect your core and upper body – both play an integral role in forward propulsion. Awesome post! Great tips to work-on for getting faster. I am going to implement a speed workout during my week to help me push the pace. Thank you for reading! Best of luck to you – I went out and took my own advice today – 10 minute warmup, 8x400m below my 5k pace, a 10 minute cooldown. Give it a try! That’s a huge improvement, nice! Thanks for reading – hope it helps! Awesome tips! I can’t wait for a new half marathon PR, hopefully beating two hours one of these days. Good luck! I finally did it in October with 1:59.